Hope Beyond Reason is the amazing account of God's prevailing power over cancer. Attacked by an aggressive, life-threatening strain of leukemia, a pastor and his family confronted their worst fears. In the middle of their battle, they came face to face with the healing presence of Jesus Christ. In this gripping true-life story, your heart will be inspired to trust the faithfulness of God in any of life's storms. As you read Dave's candid narrative, you will experience the Holy Spirit's gift of faith that knows no limits. You will discover that you too are a walking miracle, created to live miraculously. Prepare your heart to receive a Hope that will not disappoint you. 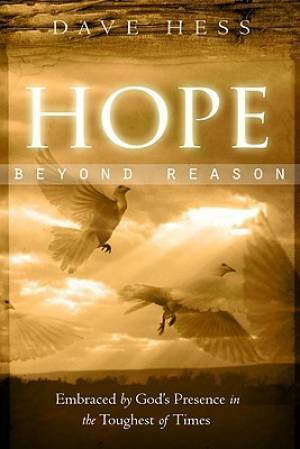 Hope Beyond Reason by Dave Hess was published by Destiny Image in September 2008 and is our 35915th best seller. The ISBN for Hope Beyond Reason is 9780768426977. Be the first to review Hope Beyond Reason! Got a question? No problem! Just click here to ask us about Hope Beyond Reason.